Edison Electric Institute Predicts 7 Million Plug-In EVs On US Roads By 2025 product 2017-09-15 17:00:46 https://insideevs.com/news/333775/edison-electric-institute-predicts-7-million-plug-in-evs-on-us-roads-by-2025/ General, forecast, u.s. The Edison Electric Institute and the Institute for Electric Innovation have released a plug-in vehicle sales study for the U.S., with a forecast of 1.2 million annual sales by 2025. 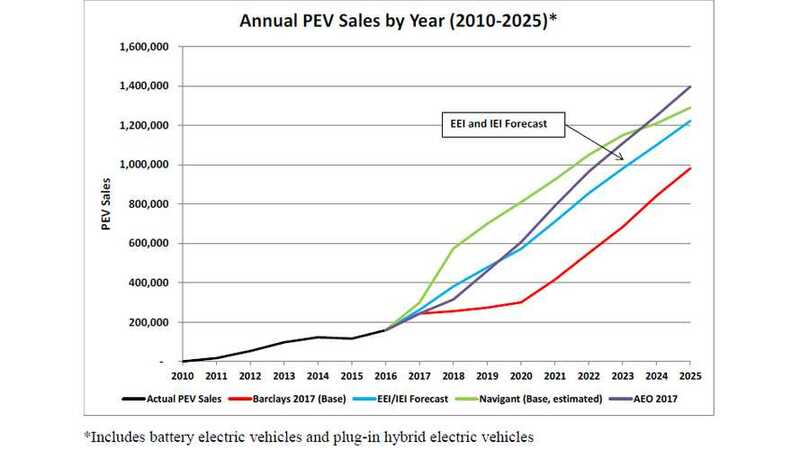 If the growth will be linear, as EEI & IEI assumes, in 2025 total plug-in vehicle fleet will reach 7 million. Today, it stands at just over 690,000 sales (through August 2017). The reports also indicates that some 5 million charging ports would be needed to support the 7 million plug-ins. For our money, the report is actually far too conservative, as it doesn't account for the "early days" of electric vehicle adoption vs. the modern era. A typical model generation lasts about 7 years, and 2018 marks the 8th year of the young industry. As importantly, next year is the start of aggressive CARB minimum sales requirements for all-electric vehicles. True to form, new and much improved offerings have started to arrive (Chevrolet Bolt EV, Tesla Model 3, 2018 Nissan LEAF, Toyota Prius Prime, Chrysler Pacifica Hybrid, etc), and automakers content to sit out the segment during gen 1 are now entering the market with their own competitive products. For an example of not being particularly current with the trends, check out the report's plug-in sales figures for Toyota in 2025 in the chart below. The results in have shown 40% gains in the first half of 2017 with only a handful of these new offerings arriving, and although July and August brought that down into the low 30s, the year-end rush will assuredly end the year close to a 50% gain overall. This growth translates to about ~220,000 sales in 2017. By 2020 alone, there are more than a dozen new offerings already announced for the US market that will have over 200 miles of range, and the total number of plug-in vehicle offerings is expected to cross 65. "Given manufacturer projections, the EEI and IEI forecast is reasonable and likely conservative." "The Edison Electric Institute (EEI) and the Institute for Electric Innovation (IEI) developed a plug-in electric vehicle (PEV) sales forecast through 2025, including both plug-in hybrid electric vehicles and battery electric vehicles, and identified the associated charging equipment infrastructure needs. 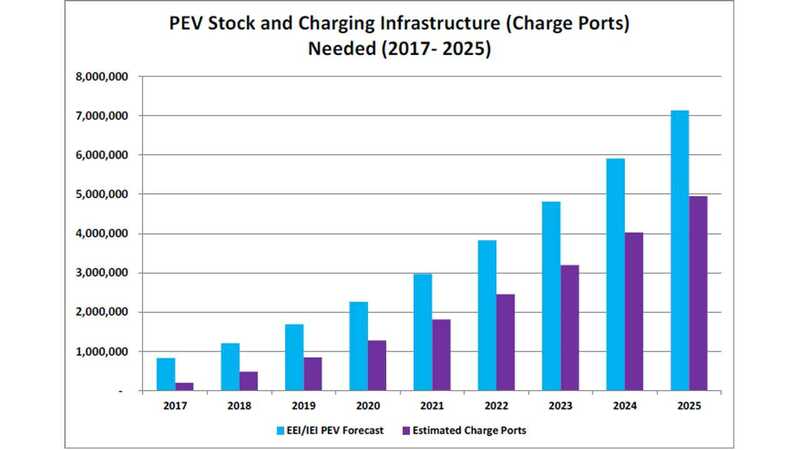 This paper identifies both the scope and scale of charging infrastructure needed to support PEVs and the different approaches to infrastructure build-out. Annual sales of PEVs will exceed 1.2 million vehicles in 2025, reaching more than 7 percent of annual vehicle sales by 2025 (see Figures 1 and 2). 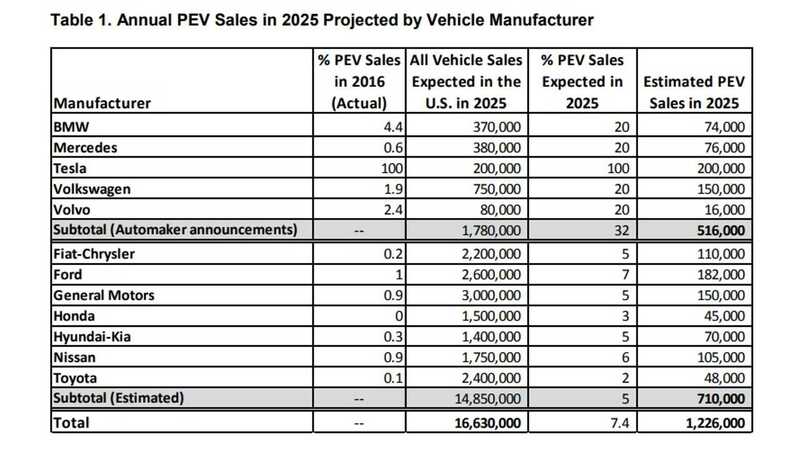 The stock of PEVs (i.e., the number of PEVs on the road) is projected to reach 7 million by 2025, up from 567,000 at the end of 2016 (see Figure 3). This is about 3 percent of the 258 million vehicles (cars and light trucks) expected to be registered in the United States in 2025. Growing customer demand, corporate average fuel economy (CAFE) standards, and declining battery costs are all major drivers of PEV sales. A continued decline in battery costs will result in increased cost- competitiveness of PEVs with internal combustion engine (ICE) vehicles. However, relaxing current CAFE standards (54.5 MPG by 2025) will put downward pressure on PEV sales. Regardless, customers are buying PEVs in record numbers, and the demand for charging infrastructure is increasing. Most PEV charging infrastructure to date is paid for by the entity that “hosts” the charging equipment (the “site host”), such as a homeowner, a commercial property owner, or a public entity. The PEV charging marketplace is evolving, and different approaches to providing the charging infrastructure for the PEV market are being tested. Electric companies are wellpositioned to help develop PEV charging infrastructure."